Since 2003, Theatre Nohgaku has hosted workshops for poets, playwrights, musicians and performers to help them better understand Japanese noh and to assist them in using noh in their own artistic pursuits. 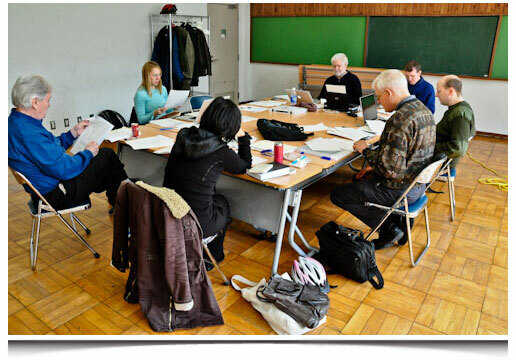 The Writer’s Workshop will familiarize participants with the structure and character of noh, a 600-year-old traditional stage art of Japan. By guiding participants toward the writing of their own noh plays, TN is fulfilling its mission as a multi-national theatre company that champions the creation of new English-language noh. In 2006, TN completed a southeast U.S. tour of Pine Barrens, a product of a previous workshop written by TN member Greg Giovanni. In 2009 and 2011, the company toured Pagoda in Europe and Asia respectively, a play written by past participant Janette Cheong. TN is expanding the canon of English noh by introducing noh’s complex structural layering of spoken text, sung text, musical accompaniment and dance to today’s inspired writers. Past participants have included award-winning artists such as playwrights Erik Ehn, Ruth Margraff and Deborah Brevoort, composer/lyricist Eric Schorr, and poet Lee Ann Brown. This year’s workshop includes three days of seminars led by composer/playwright and former Hosho-ryu professional David Crandall. Discussions focus on the function and form of typical noh plays, including aspects of musical and literary structure as well as historic/poetic referencing. Subsequent discussions focus on the unique challenges of adapting and writing noh for the English language. Participants will be invited to complete writing assignments, some of which the instructor will set to music for demonstration purposes in class. For more information and how to register, please visit our website. This entry was posted in Workshops, Writer's Workshop and tagged david crandall, deborah brevoort, erik ehn, greg giovanni, janette cheong, noh writers workshop, pine barrens, ruth margraff, shinsaku noh, theatre nohgaku. Bookmark the permalink.